I seem to always some version of the Brooks Glycerin in my rotation. I’ve run in several models, and the Glycerin is my favorite. It has the most cushion of any Brooks neutral shoe. The Glycerin is designed for training. It’s Desi Linden’s favorite training shoe. With the amount of the cushion, it’s great for the bulk of mileage. For me, it’s an easy run, daily run, or even recovery run. I’m not a Brooks ambassador or blogger or being paid to talk about the shoe. Brooks didn’t update much from the Glycerin 16 to 17 which is appreciated. The significant updates come with the shoe’s upper. There is more 3D printing and fewer seams. I didn’t really notice a difference. The Glycerin 17 uses a Double Jacquard Mesh upper. Basically, it’s two layers of fancy mesh to prevent toes from ripping through. It’s breathable and flexible while still having structure. The shoe is available in wide. I wear between a size 10-11 wide for women. I’ve worn either a 10.5 or 10.5 in Glycerin depending on the year. This year, the 10.5 is fine. If you have bunions, I recommend the wide. For those who like the Brooks Ghost, it’s more cushion than the ghost but a more narrow fit. I always say, I wish the Glycerin had the fit of the Ghost. The Glycerin is plush with plenty of cushioning. It’s soft, so you feel as though your foot sinks in. The Glycerin uses Brooks DNA Loft foam. The DNA Loft foam is designed for comfort. It’s not a responsive shoe and not intended to run “fast”, although you could if you wanted. If you like the Hoka Clifton, you’ll appreciate the Brooks Glycerin as well. In my rotation, it’s fit in a daily or recovery trainer. The traction is fine on inclement days and I’ve run outside in the rain, sleet, and snow, with no issues. My only issue is we’ve had all of that in the first week of March. Not much has changed between models which I’m thankful for! It’s still light and kept under 9 ounces for women. If you like the previous versions of the Glycerin, the newest one feels very similar. If you’re looking for a high soft cushion trainer, it’s a great option too. If you want to read more about running industry and news, subscribe to my weekly newsletter. What is a shoe you’ve run in several models of? What is your current favorite shoe? Truthfully, I haven’t run in a lot of New Balance. Many moons ago, I was injured in my final year of running cross country. I had been “fitted” for a pair of New Balance shoes, and they were the last pair of trainers before my cyst injury took me out in 2012. It wasn’t the shoes fault, but since then I haven’t found a lot of New Balance shoes that feel comfortable to me. I’ve tried the New Balance 880 as well as the Fresh Foam Zante. Both are quality shoes, but they both didn’t have the maximum and plush cushion that I prefer. Enter the New Balance 1080. This has quickly become a staple in my rotation as one of my favorite shoes. New Balance isn’t paying me to tell you that, and I’m not Emma Coburn’s teammate. In fact, I’m as a surprised as you are of how much I like the shoe! As someone with a more full foot and toebox, I appreciate that the 1080 has a full, seamless, toe box. It’s deep enough to hold an insert and wide enough to have plenty of space if you’re dealing with bunions or need extra space. I wear anywhere between a 10-11 wide in running shoes, and the 10.5 regular width is comfortable for me. I’ve tried on previous versions of the 1080 but never run in them. This is my first review of the 1080. From my knowledge, the 1080v8 hasn’t been updated too much since V7 (version 7). Most people who have liked the previous versions, also like the V8. For how much cushion is in the 1080, it’s much stiffer than other plush models such as the Brooks Glycerin or Saucony Triumph. The stiffness allows a bit more responsiveness. Another note is the shoe feels much flatter than many other plush brands and has an 8 mm drop. One thing I appreciate is the flex grooves in the forefoot. As someone who runs very far on their forefront, it’s support and flexibility I need. I’ve run both on the treadmill and outdoors, and the shoe feels great. Although I haven’t worn previous versions, I know there aren’t significant changes to the shoe. If you like the previous version, then you will continue to like the 1080. If you’re new to the shoe, like me, then you’ll enjoy how soft and cushioned it is. What shoe brand are you “most loyal” too? Do you like maximum cushioned or minimal shoes? While living in Alabama, I committed one a runner sin. I was underprepared shoe wise for 6 weeks. While I could have gotten a pair of shoes I’ve already run in, I decided to try the Saucony Freedom. Before leaving, I had tried them on at work. They seemed like they would be a good shoe for me. This is the first model so there is nothing to compare it too. I have run in multiple other Saucony shoes including the Kinvara, Zealot ISO 1 and 2, Ride 9 and Triumph ISO 1 and 2. The Freedom uses Saucony’s signature Everrun material. It is the first of the line to use the Everrun at the forefront of the shoe. What does this mean for me? As someone who strikes extremely far to the front, there is plenty of cushion up there too. There are actually very few shoes with a full length cushioning in the forefront too (most shoes have a lot of cushioning in the heel and it tapers to the front). 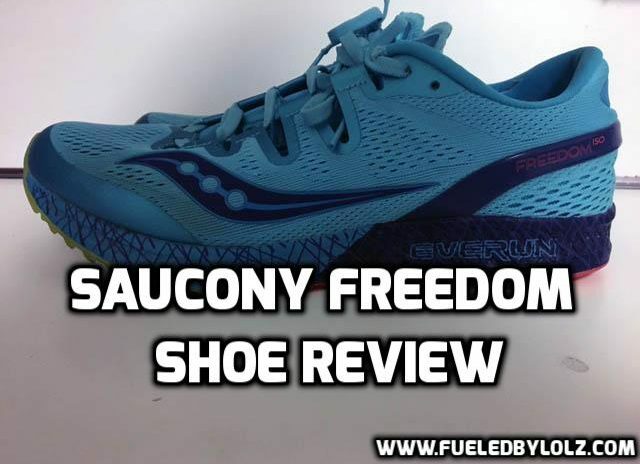 Just like the Saucony Triumph and Zealot, the Freedom uses the ISO fit. It fits more like slipper than an actual shoe. I find the ISO fits my foot better but the shoe does run short. Typically I wear a size 10 but I found the 10.5 to be the best fit. I even contemplated doing an 11 or a men’s size 9 because I could use more width. I would recommend going up at least a half size if not more. This was definitely interesting. I could feel the extra cushion in the forefront immediately. My first run in the shoe was an easy 7 miler. It felt comfortable the moment I put it in on. It was soft, yet responsive and the extra cushion for my metatarsals was immediately noticed. There aren’t a lot of options with extra cushion in the front. Both the Saucony Kinvara and Zealot ISO 2 have a 4mm drop and are the closest by far. The Asics Nimbus or adidas Energy Boost has a good amount of cushioning in the front as well. Where do you wear out a shoe first?